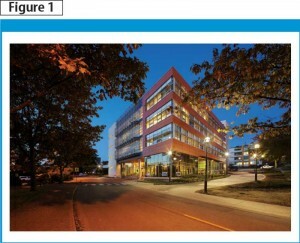 This article describes how these environmental challenges were addressed through two building projects: the Centre for Interactive Research on Sustainability (CIRS) at the University of British Columbia (UBC), and Edmonton’s City Centre Redevelopment (CCR)—a community development planning project. 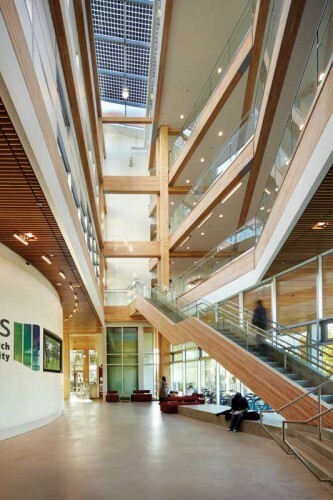 In 2004, the CIRS team set aggressive environmental performance goals that reached well beyond Canadian Green Building Council’s (CaGBC’s) Leadership in Energy and Environmental Design (LEED) Platinum certification requirements. 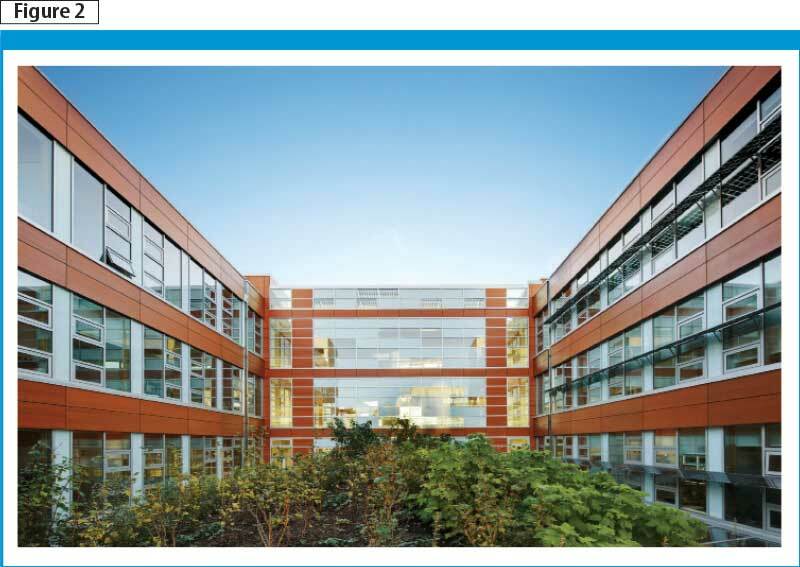 In 2006, the Living Building Challenge (LBC) emerged and was determined to be well-aligned with the CIRS vision. 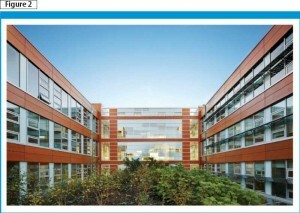 As such, the project proceeded, pursing certification under both the LEED and LBC rating systems. 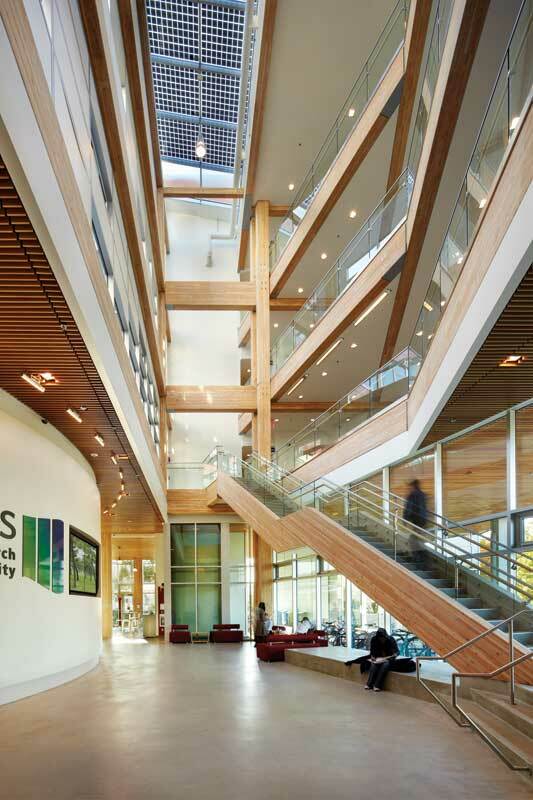 The Centre for Interactive Research on Sustainability (CIRS) at the University of British Columbia (UBC) is located in Vancouver. The living roof at the Centre for Interactive Research on Sustainability, over the auditorium. 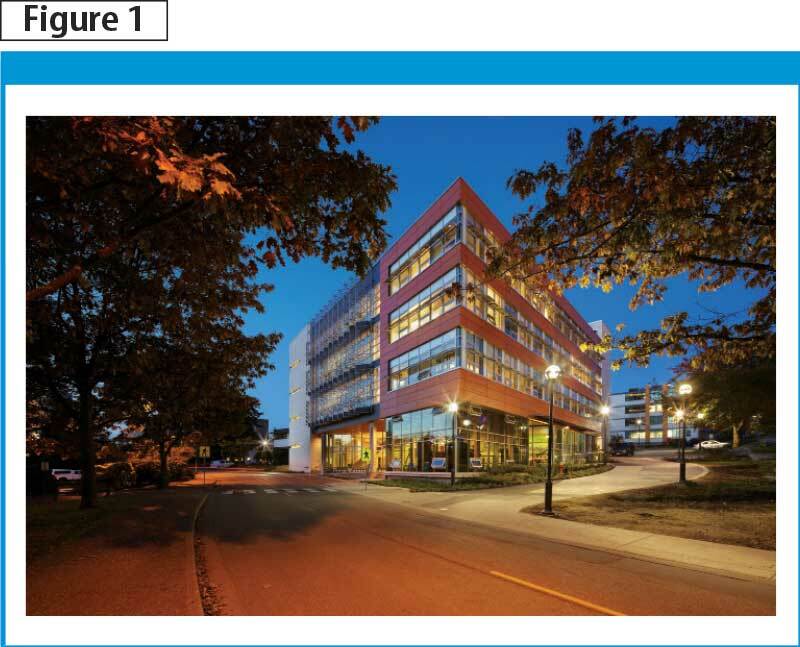 A high-performance building envelope, passive design strategies, provisions for inhabitant control of personal space, and energy-efficient equipment were used to minimize the building energy loads and use. 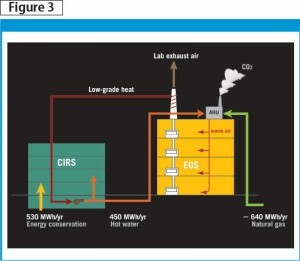 A heat recovery system captures laboratory exhaust waste heat from the adjacent Earth and Ocean Sciences (EOS) building and transfers it to the heat pumps in CIRS. These provide heating and cooling for CIRS through the radiant slabs and a displacement ventilation system. The heat pump system returns excess heat from CIRS heat pumps to the EOS building to heat laboratory ventilation air, reducing its heat load and the demand on the campus steam system. Annual energy use for CIRS and Earth and Ocean Sciences (EOS) building energy saving. 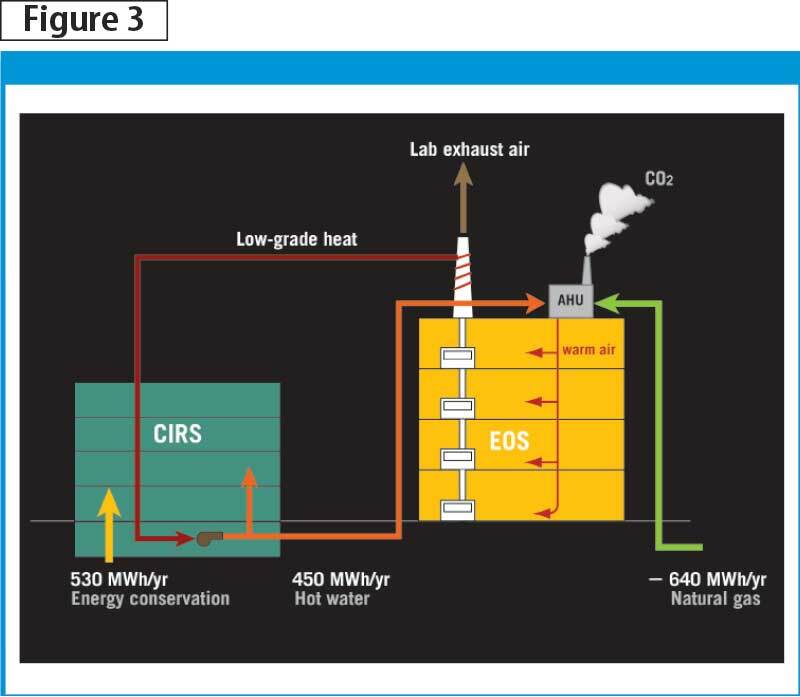 While CIRS uses 530 MWh of energy annually, 640 MWh of heating energy is reduced at EOS for a net annual campus energy use reduction (Figure 3). A ground-source geo-exchange field supplements the waste heat recovery and provides heating and cooling to the heat pumps. An evacuated tube array on the roof captures solar energy to pre-heat the domestic hot water and an internal heat recovery system captures waste heat from the building systems. Photovoltaic (PV) cells on the atrium roof and window sunshades convert solar energy into electricity. Ongoing monitoring and research will study the energy consumption and effectiveness of the building systems in relation to inhabitants’ behaviour and help optimize the facility’s operation. All wastewater is treated onsite and reused for toilet-flushing and irrigation. Stormwater is collected on the roof, stored in cisterns, and treated for use as building potable water. 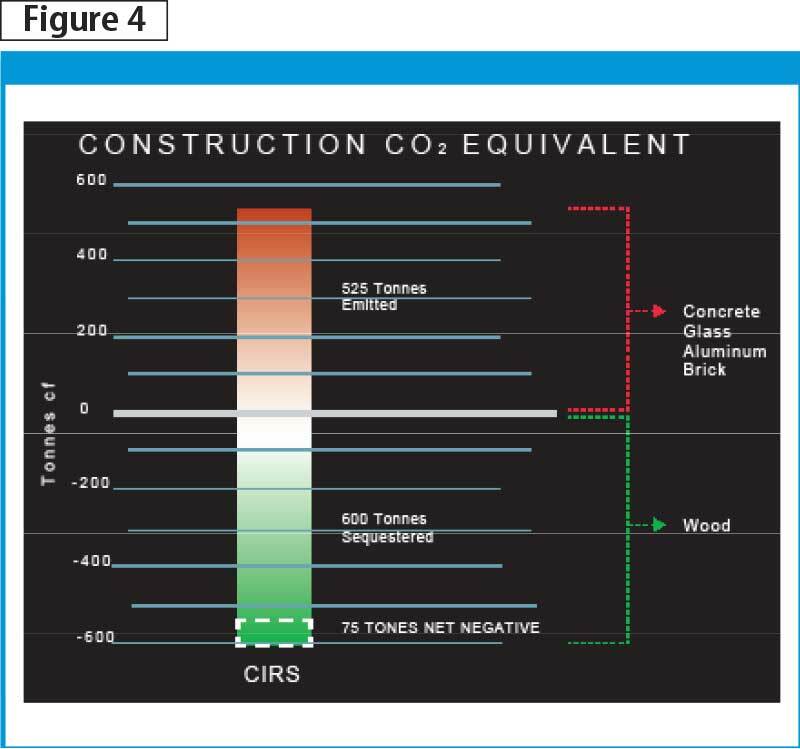 The materials employed in constructing CIRS were selected considering two criteria in addition to traditional issues: greenhouse gas (GHG) emissions embodied in the materials, and health impacts to occupants related to off-gassing. Local mountain pine beetle (MPB)-affected wood was used, sequestering 600 tonnes of carbon dioxide (CO2). 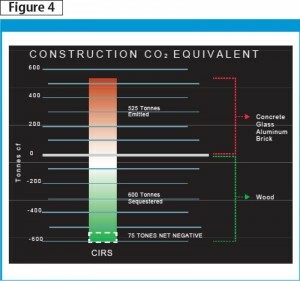 The embodied emissions of the other building materials such as concrete, steel, aluminum, and glass totalled only 525 tonnes of CO2, for a net reduction of 75 tonnes (Figure 4). Embodied carbon emissions from construction materials. the previous condition of the CIRS site included a warehouse with no landscape support for flora and fauna—CIRS includes a vegetated roof over the auditorium with a diverse range of planting to support the local fauna, and site landscaping includes exterior vines on the west glazed façade to provide shade in the summer and allow penetration of winter solar heat after the seasonal leaves fall.